Coming into the season, Boston Celtics’ fans had many reasons to be excited about their team. They had just come off of an amazing offseason that saw them sign the top player in free agency, Gordon Hayward, trade for star point guard, Kyrie Irving, and draft the possible future of their franchise, Jayson Tatum. It seemed as if this could finally be their year, as they had everything needed to dethrone Lebron James and the Cavaliers as the best team in the East. The veil of optimism that surrounded this franchise was shattered during the first game of the season, when Gordon Hayward suffered one of the worst injuries in NBA history, a mere six minutes into his first game as a Celtic. Hayward suffered a dislocated ankle and broken tibia, effectively ending his season. This freak injury destroyed Boston’s title hopes as fast as Hayward’s arrival created them. A blow this significant can easily leave a team hopeless for the future of the season. While it may be true that the Celtics no longer have a chance to win an NBA Championship, they still have plenty to play for, as the Eastern Conference is still extremely weak. Even with Hayward out for the season, they are at worst a five seed. With the East being as shaky as it is, it is not out of the realm of possibility to think Boston has a chance to return to the conference finals, if the necessary players step up. The question is, who are these players that can step up to replace Hayward’s production? 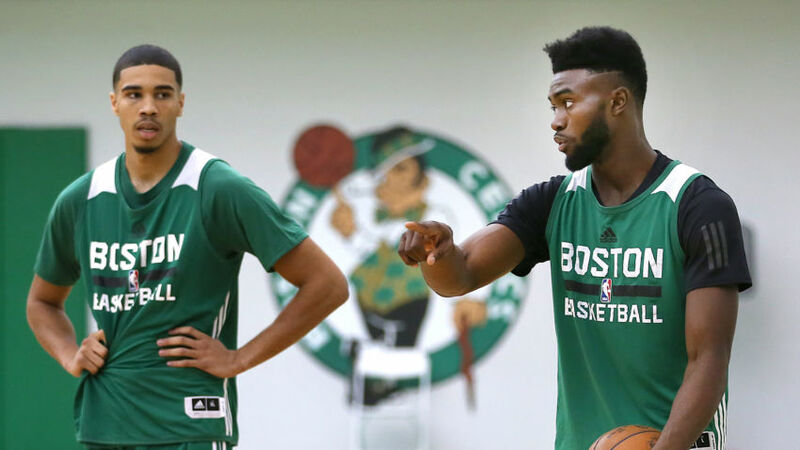 While there may not be one player ready to take over as the Celtic’s new star player, the combined efforts of Jaylen Brown and Jayson Tatum may be able to keep Boston in contention. In my mind, replacing players is all about seeing how many points per game that player would have scored for you, and finding where you can make up those points elsewhere on your roster. There is obviously more to team building than just PPG, such as defense, depth, ball movement, chemistry and much more that I could go on listing forever. But making up for a player’s PPG is a good place to start in at least attempting to recover from a loss of this magnitude. Gordon Hayward was about a 20 PPG player while in Utah. We can assume that is around what he would have put up in Boston, perhaps closer to 23 PPG, as the offensive system Brad Stevens runs is far superior to that in Utah. Last season Jaylen Brown averaged 6.6 PPG, and Jayson Tatum was still in college. Brown has shown in the first three games of the season that he is capable of making the leap to an around 18 PPG player, with a much larger role in the offense and more developed skill set this year. Along with Brown, Tatum looks as if he is capable of playing a sizeable role in the offense in his rookie season. Coming into the league Tatum was widely regarded as the most polished prospect in the draft, meaning he has the most potential to contribute to his team right away. It is not unreasonable to think that Tatum will be able to average a solid 12 PPG as a starter this year, as in two of his first three games he dropped 14 and 15 points. If these two players can perform at this level, the Celtics obviously won’t be as great of a team as before Hayward’s injury, but they can still be a very good team. With Hayward out, Marcus Smart was inserted into the starting lineup at shooting guard, while Jaylen Brown was moved to small forward. With Smart’s points leaving the bench, backup guard Terry Rozier will have to lead the bench offensively. Last season Rozier averaged 5.5 PPG for the team, in a relatively small role. While his numbers aren’t impressive by any means, anyone who watched the Celtic’s play last year saw flashes of a good player in Rozier. He is a very capable player, with the ability to contribute around 13 PPG off the bench for the team, which will be necessary for him to do or the Celtics’ bench will regress greatly. In the two games since Hayward went down, Rozier has put up 14 and 15 points, on very efficient shooting. Rozier, alongside Shane Larkin and Marcus Morris have what it takes to keep the Celtics bench respectable. If Brown and Tatum provide the necessary production, along with solid bench play and Kyrie Irving’s offensive prowess, the Celtics can come close to last season’s success. While Hayward’s injury was horrible for both the team, and him as a person, there is one “good” thing that comes from him missing the season. Jaylen Brown and Jayson Tatum, the team’s future, will be thrown into the fire, as they are relied upon heavily at a young age, which will likely help them to develop faster than if Hayward was still there. When Hayward comes back next season, the Celtics will be in the perfect position to contend. With Lebron a year older and rumored to leave Cleveland, Hayward being 28 years of age and in his physical prime, Brown and Tatum having taken advantage of a year to develop their skills, and a prime Kyrie Irving, who is arguably one of the top offensive point guards in the league, the Celtics will have everything it takes to win the East in the 2018-2019 season. Posted in Sports and tagged basketball, boston, celtics, gordon hayward, injury, NBA. Bookmark.